It is school reopening time and most mothers are busy wondering which new nutritious snack would be a good choice to add to their lunch box menu. To get children to eat all veggies and healthy food is a huge challenge. One way is to get all the nutrition into a roll with some yummy sauce/chutney. Let us try this one which has 3 types of dals and loads of veggies. Boil the dals together with enough water to cook them. Once cooked, drain the extra water and keep it aside. Make a dough out of the wheat flour, knead it well and let it sit for 15 mins. Meanwhile we can prepare the filling. Boil carrots and cauliflower separately. Saute all the other vegetables in sunflower oil. Once they are cooked, add the cooked dal, carrots and cauliflower and mix. Add the seasoning along with required salt and let the vegetables cook till the filling is thick. Now our filling is ready. Roll the dough into lemon sized balls and make rotis out of them. Take each roti, place the filling along the centre, add grated cheese on top and roll the sides onto each other to close the roll. You can use a little water to close the roll so that it does not open. You can cut the roll into three pieces, so it is easier to eat. 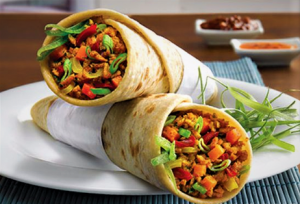 You can pack this as lunch for your kids along with their favourite sauce! 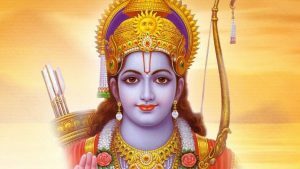 Lord Rama’s birthday is celebrated all over India on the 9th day, Navami of the Chaitra month. It also signifies the end of Vasant Navaratri. Lord Rama, the seventh Avatar of Lord Vishnu, was born to King Dasaratha and Queen Kaushalya, in order to slay the dangerous demon king Ravana. To celebrate his birth, devotees all over the country perform pujas, sing bhajans and offer a variety of prasad as holy offerings to the Lord. Here are a few of them. 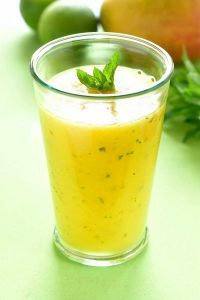 A very easy drink to make, this dish is a coolant in these hot summer times. Soak the jaggery in water for about 15 mins. Once it melts mix it well to make sure there are no lumps left. Strain it to remove impurities. Now add the cardamom and dry ginger and stir. It can be served as it is or chilled. Add water to curd and churn it to get diluted buttermilk. Add salt, hing, chopped green chillies, grated ginger,curry leaves and coriander leaves. Serve chilled. Soak the Moong Dal for an hour. Drain the water. Heat a little oil and add mustard seeds to it. When it crackles add it to the Moong Salad. Add salt, chopped green chillies, grated coconut and coriander leaves. This is served as it is to the God. Hope you all enjoy preparing these simple prasadams. Ugadi, celebrated all over Telangana, Andhra Pradesh, Karnataka and Maharashtra, is festively observed as the first day of the Lunar Calendar.Among the few legends associated with Ugadi, there is one pertaining to Brahma that is widely popular. It is believed that Lord Brahma began creating the world on this day and Ugadi refers specifically to the Yuga in which the current generation lives i.e. the Kalyug. Ugadi also coincides with the onset of spring and the harvest season. A variety of sweets and savories are prepared as part of a sumptuous feast across all states. In Telangana and Andhra, people love to add the Green Mango or Mamidikaya Pulihora to their delectable menu. This is a dish which requires no preparation and is pretty easy to make. 1.Heat the oil. Add Mustard seeds, Jeera, chana dal, Urad dal, green chillies, red chillies, hing and curry leaves. Roast them for one minute and then add the grated mango.Add a little salt to this. 3. 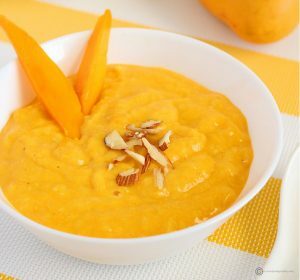 Once the mango is roasted, add the cooked rice. Mix well, add salt and turmeric to the mixture. 4. 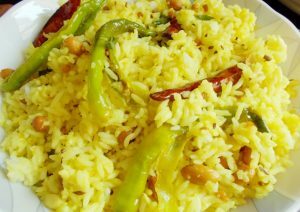 When the rice is well mixed with the mango, add the roasted peanuts and cashew. This pulihora takes very little preparation time and is a tangy favourite of many. It can be served with vadiyalu (fryums or papads) and a pachadi or any raita of your choice. The cold Marghazi / Dhanur month of our Tamil Calendar brings in a series of early morning pujas and delicious prasadams, Ven Pongal being a standard neivedhyam for every Dhanur masa pujai. On the full moon day of this month, we celebrate Thiruvadarai, which has many a concept attached to it. Some say this is the day Shiva entranced his devotees with his Cosmic Dance, while some believe that Lord Shiva agreed to marry Goddess Parvathy and so, the beliefs go on. This is the day of the Aarudra/Thiruvadarai star which can be spotted shining bright red like a ruby, in the North-West skies. 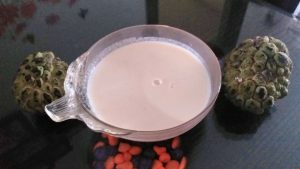 The unique thing that is common across most tamil households is the Kali, that is made as prasadam on this day along with the Ezhukari kootu/kozhambu. This awesome combination is mouth-watering and irresistible. Wash the rice and dry roast till it turns brown. Cool it down and pulse it so the rice is broken. Sieve the broken rice and discard the fine powder. Boil the Toor Dal separately till it is half cooked. Now boil 3 cups of water. (You can adjust the water according to how your rice cooks). Add the roasted broken rice to the boiling water and cook. In a separate pan, boil water and dissolve the jaggery in it. Add the half cooked toor dal and grated coconut and let it boil for a few minutes. We don’t need a one string consistency for this recipe. Add this jaggery water to the cooked rice and transfer the contents to a pressure cooker. Cook for 2 whistles (adjust according to your cooker). This helps in getting the kali to be soft and fluffy instead of being pasty. Heat ghee in a pan and roast the almonds, cashews, raisins and cardamom. Add this to the hot kali and enjoy! 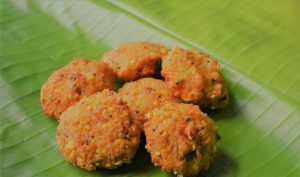 Ezhukari kozhambu, as the name suggests has seven vegetables in it. You can use more than seven too. It tastes awesome when taken with the Kali. Pressure cook the Toor Dal and keep it aside. Use the soaked Tamarind to make 5 cups of Tamarind water. Boil the vegetables in Tamarind water along with Turmeric and salt as required. Roast all the ingredients for the masala in very little oil and grind it in a mixer. Once the vegetables are par boiled, add this ground masala to the tamarind water and boil. When the vegetables are cooked, add the boiled Toor Dal along with little water left over from cooking the dal, for getting the consistency of the kozhambu. Heat ghee in a seasoning spoon and add all the ingredients for seasoning. Once they splutter, add it to the kozhambu. Our Ezhukari Kozhambu is ready to be served with Kali. 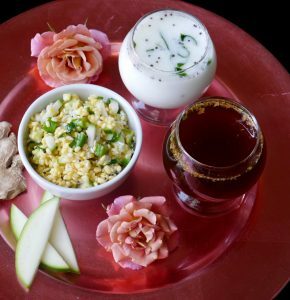 Enjoy our traditional Kali and Kozhambu that taste like heaven, on a cold Marghazi Day!